DESCRIPTION: Arsenic Removal System for the Baldy mesa Water District under contract with the technology provider Basin Water. Mechanical systems for 6,000 GPM arsenic removal treatment system including: 8 Pre-Filter Strainers; Steel pipe manifold assembly; 3 independent Train assemblies; 48 Treatment Vessels; and 3- 700 gallon reactor tanks. IWS worked as a team player with Basin Water and the Baldy Mesa Water District to make this project a success. 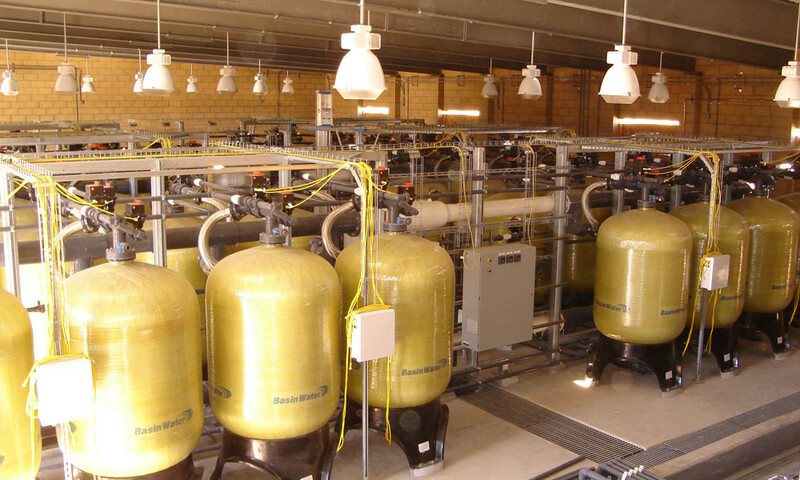 Integrated Water Services, Inc. (IWS) completed the installation of a state-of-the-art Arsenic Removal system for the Baldy Mesa Water District in Hesperia, CA under contract with the technology provider, Basin Water (Nasdaq: BWTR). 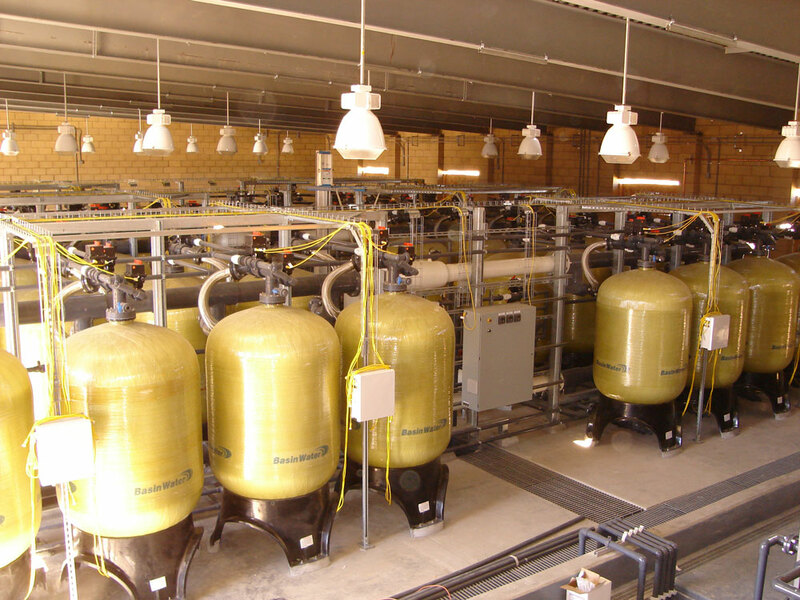 Construction included the installation of a patented Ion Exchange (IX – Basin Water) System, and various system support components including the Brine Processing and Chemical Feed System, Exterior Salt and Waste Storage Tanks (UniPure), and Raw Water Pre-Filter Pipe and Manifold Assembly (Hayward/Eaton). The process and treatment system was installed in a 60’ x 105’ CMU structure that also provided an enclosed area for electrical power and controls, chemical storage and feed system, sludge storage and press apparatus, and space for an additional IX process train in the event the plant treatment capacity is expanded to its design capacity. The raw water was introduced to the facility from several point sources in the Baldy Mesa District and flows through a 2,000 GPM four-point pumping system. After leaving the pumping platform, the raw water enters eight stainless steel Hayward/Eaton Pre-Filter Strainers via a 45’ x 24” steel pipe manifold assembly with individual 8” feeder lines and steel gate valves that sits on the exterior of the building. The arsenic treatment system installed by IWS consisted of three independent Basin Water IX Train assemblies each having sixteen treatment vessels, for a total of 48 vessels. These trains process the raw water and remove the arsenic and other by-products, discharge the finished water, and manage the regeneration of the treatment media via the Brine Processing Unit (BPU) through the associated Brine Processing Rack attached to each train. The 48 vessels have a treatment capacity of 6,000 GPM, with an expandable volume of 8,000 GPM with the installation of the future train. The BPU system allows for the cleansing and regeneration of the arsenic treatment media within the vessels, and separation and removal of the concentrated arsenic from the system, as well as eventual removal from the plant. This is accomplished through the use of the 3, 2,000 gallon reactor tanks that provide for chemical mixing and settling of the arsenic, and the ultimate transfer of waste material to the sludge press for processing and removal to a hazardous waste burial site. The BPU sits within a separate containment area within the treatment building. Its manner of chemical processing and media regeneration is achieved through the introduction and management of ferric chloride and ferrous chloride via 2, 500 gallon, double-contained tanks, and sulfuric acid contained in a similar 1,000 gallon tank. These chemical storage tanks were also installed as a part of the IWS scope, and are located in separate rooms adjacent to the BPU Area. The Sludge Press receives the concentrated waste products allowed to settle out in the BPU reactor tanks, and is temporarily stored in a 750 gallon sludge storage tank. The sludge is moved to the press, which compresses the waste to remove all remaining water within the slurry. This allows for the formation a concentrated “cake” for proper collection and removal into a 55 gallon steel drum. This reactor vessel and sludge press system allows for a 90% capture of this processed water thus providing a direct cost savings by reducing waste water loss. A steel jib crane with attached electrical hoist- also installed by IWS will lift the drum out of the containment area for removal by a contracted hauler. The exterior Salt and Waste Storage containers consist of 4, 16,000 gallon polyethylene tanks and associated pumps that are situated within a 24’ x 80’ containment pit, 4’ 0” below finished grade along the northern half of the facility. The Salt Tank provides the sodium product by which the arsenic media is regenerated once it reaches its maximum limit limits, and the three Waste Tanks store the excess waste water and other by-products formed by the process not slated for reused. This waste material is not designed to be released into the municipal wastewater collection system, and will be removed by a contracted entity. Pneumatic Sludge Press and accompanying compressor system. The entire mechanical system was disinfected and hydrostatically tested before being put into operation. Pat Kelly, General Manager of Basin Water said of the project “IWS worked as a team player with Basin Water and the Baldy Mesa Water District to make this project a success”.